A casualty of Hoboken's anti-wheeling law, where limits placed on money entering into the City from outside parties such as Political Action Committees (PACs) took its first big hit when Councilwoman Beth Mason flooded thousands of illicit dollars into the recent Move Forward BoE campaign. 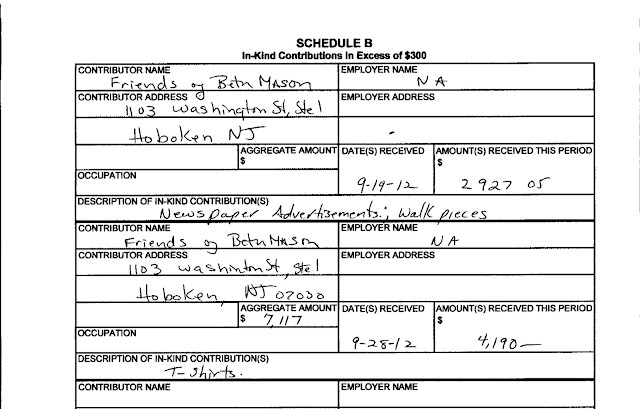 The exact figure may not be determined in the end, even when campaign filings are made with NJ ELEC but an earlier filing shows there was over $7,000 in-kind expenditure made from the Mason PAC, Friends of Beth Mason in October. $500 limit in September and observers think it's been trampled in the tens of thousands of dollars. Beth Mason says the ordinance doesn't apply to her because she says so. Hoboken's Corporation Counsel confirmed the funds are not allowed under Hoboken's current ordinance but Councilwoman Beth Mason has ignored the finding and said the law isn't applicable to her. illegalities during our campaign according to the State of New Jersey. The Beth Mason - Move Forward official line is to say no ordinance in Hoboken applies and can be ignored at will calling the Hoboken ordinance passed in July 2011 "made-up." As a result, Oland determined Hoboken is inert and the laws on the books in the City don't need to be followed. The State of NJ isn't required to make any "final determination," as the law is perfectly constitutional in its present form. Similar anti-wheeling rules are on the books in various towns in the state of New Jersey. Correction: The Friends of Beth Mason committee address is incorrectly listed (above) per Ines Garcia Keim who noted she is no longer the treasurer of the committee. The 2012 treasurer of the committee is Ricky Mason. 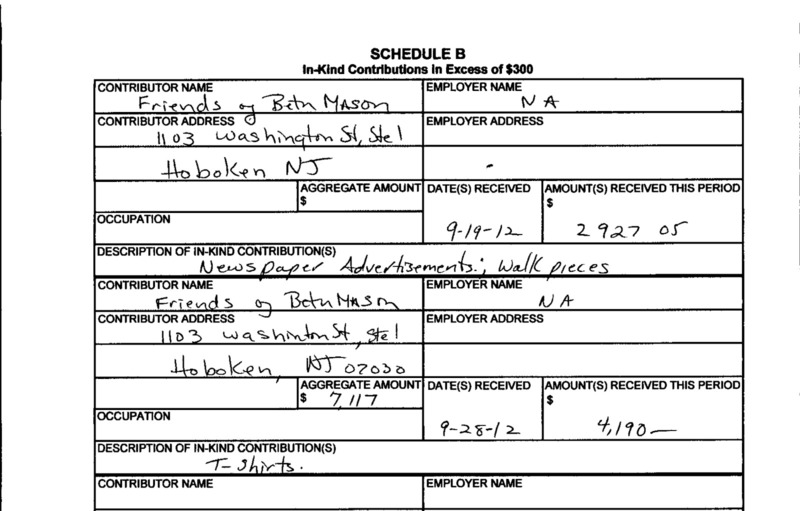 She also said she had no connection to the 2012 filing (shown above in Schedule B) for The Friends of Beth Mason committee explaining whoever filled out the above form did so referencing dated checks. Talking Ed Note: Beth Mason has decided the law does not apply to her based on pure whim. Voting against an ordinance does not give license to trample it simply due to opposition after its passage. Does anyone find the irony in Beth Mason passing local ordinances and saying she herself is above the law on those she doesn't like? including the Move Forward commercial? It's one of many large expenditures yet to be declared. Related: Grafix Avenger connects the dots on the politics of the SLAPP and the BoE election. The pattern of attack is evident and a certain letter of dubious origin. Update: In regards to taking legal photographs on a public street, re: 12th and Washington, there's nothing illegal about returning to take photos of signage that didn't come out the first time. It certainly doesn't justify anyone running out of an office committing assaults particularly when Hoboken was in a state of emergency. Some witnesses suggest it's okay to stand by and do/say nothing. It's beyond insulting to hear witnesses make excuses for the behavior of a paid Beth Mason political operative. That hasn't been solicited but the noise is coming out of familiar corners.